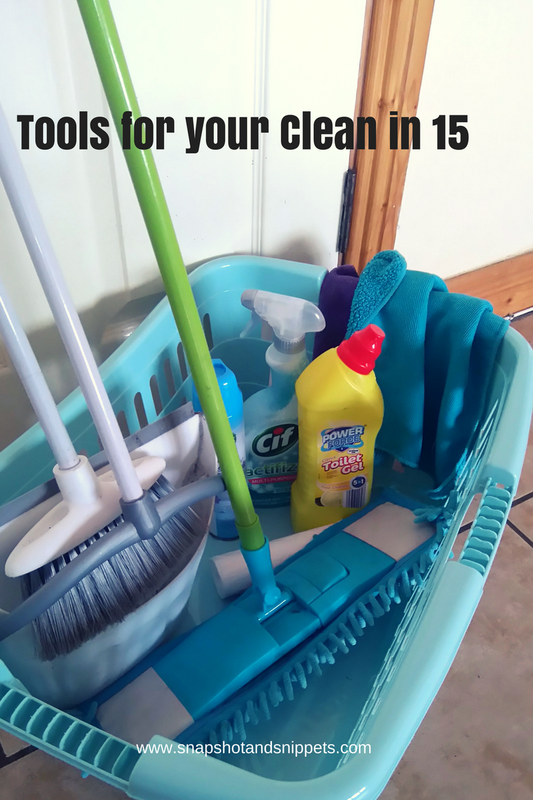 You are here: Home / Organization / How to clean in 15 – when visitors are calling. 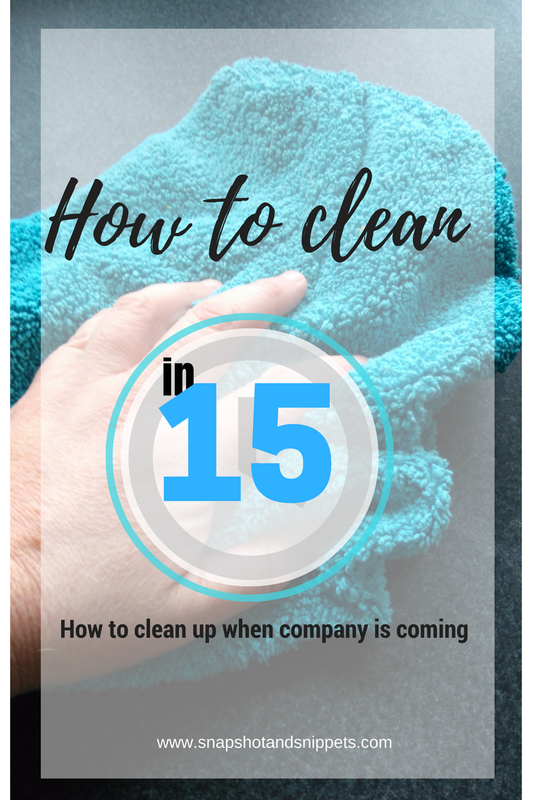 How to clean in 15 – when visitors are calling. 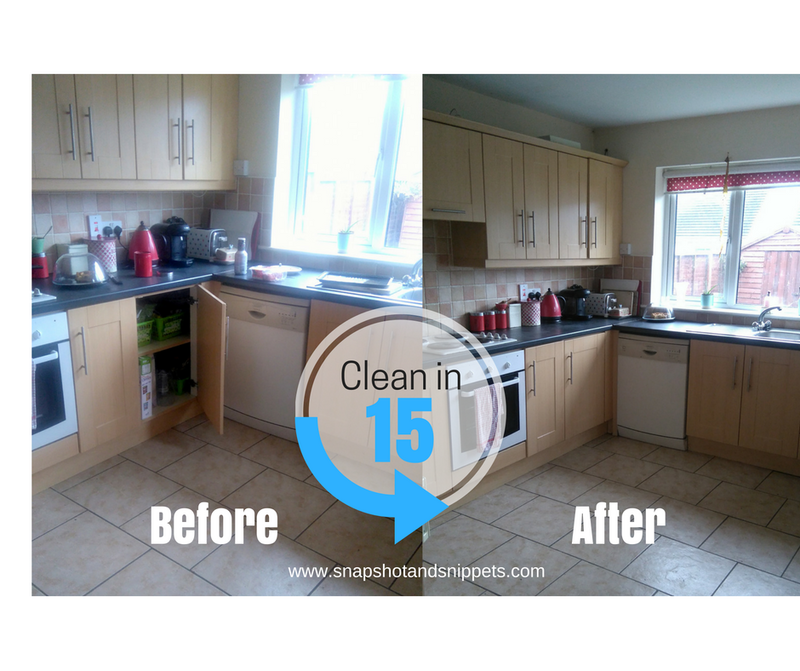 I was asked the other day how my house looks so tidy – truth is it doesn’t, I live with teenagers and animals it gets messy really quick. So why do people think it is tidy ? Because I have a system I call clean in 15 if I know visitors are calling which works every time – okay not the time one of the dogs decided to dig up my raised bed and run through the kitchen covered in mud – but every other time, it works every time ! So you know the scenario – your partner rings and says they are bringing the boss home or worse your in Laws !! Or your nosey neighbour says they are popping in 20 minutes to discuss the Local Neighbourhood Watch. So how do you clean up for visitors in 15 minutes ? Or as I like to call it How to Clean in 15 ! Before you start a disclaimer – this is not for people that live like people in The World’s Worst Hoarders (it will take you longer people !) this method works for people like me that have a house that is relatively organised but lived in…I also suggest not cleaning unnecessary rooms ,that is what doors are for ! No need to tackle your teenager’s pit or your toddler’s room if it is not needed. Focus on the rooms your visitors are likely to be in, so in my house, it is the kitchen, the hall, the downstairs guest bathroom and the living room that I tackle. I shut the door to my daughter’s rooms upstairs and the utility room – no one needs to see that! 1. 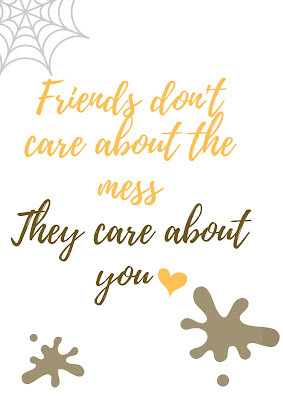 First things first grab your tools and assess the damage and grab any extra people in the house to help clean !! In the kitchen with is the counters, sink, floor. In the Hall, it is usually dust bunnies from the moulting dogs and kicked off shoes and dumped coats. In the living room – is kid clothes, kids things and cups. 2. Using the basket and the bin bags and working in a clockwise direction in each room – pick up rubbish and collect things that need to be put away and put them in the basket this will help you carry them to their destinations, collect any dishes and take them to the sink or dishwasher. If the sink is full empty it onto the counter and start to fill with hot water. While it is filling pop into the bathroom and put bleach or toilet cleaner in the toilet to soak and put the rubbish in the bin. 3. Wash any dishes and put them away, wipe the sink, clear the counters and the table and wipe them down with one of your micro fibre clothes and multi-surface cleaner – the reason I use multi-surface cleaner is because it is easier to deal with one smell and something that can tackle glass and wood and counters all in one bottle. This is not the time for detailed cleaning and specialised products. 4. Put dirty clothes in the laundry, I put shoes in the shoe box we have in the downstairs bathroom, kids belongings head upstairs. While upstairs I collect toilet roll and a clean towel for the bathroom if they are needed and tidy the hallway. 5. 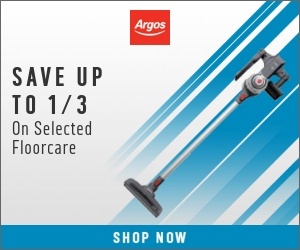 Quickly sweep the floors in each room and if you have time you can even vacuum if your feeling adventurous. 7. Finally put your cleaning supplies back in the basket and take them to the utility room shut the door and use a room spray or light your favourite smelly candles and relax – knowing that your house looks clean !